I'd like the Winter Lily Bouquet. I follow you publicly via GFC as ms-texas! i subscribed in my google reader! Fun giveaway - thank you for the chance to win! I would get the candy classics basket. I like the Big Snow Tin from The Popcorn Factory. Please enter me in this giveaway! 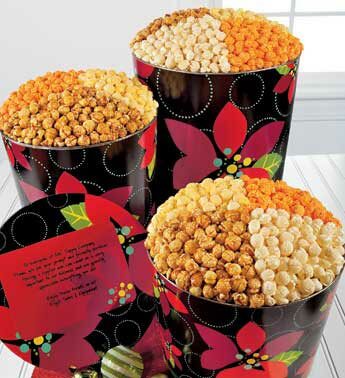 My sister loves popcorn and this would be a great gift:) Thanks! I would choose this one! Yum!! Love the Fields of Europe for Christmas bouquet. If I won, I would get these flowers for my mom. I tweeted about this today. Wow, that's not even fair! My mouth is now watering. haha, I would choose some mint meltaway combinations and some brownies from Fannie May! I love the Belgian chocolate-covered Oreos from 1-800-flowers! I also follow on twitter...what a fab giveaway! I like the Decadent Chocolate Dipped Strawberries. How fun. Don't enter me, though. I thought I had completely missed you at the event. How nice that they sent you a little something.